I have always loved dogs and animals since I was very young. I always knew I would work with animals and started as the neighborhood dog walker at only seven years old. I went to college for animal science thinking I may be a vet, but was more interested in the behavioral aspect of animals than biological so I started training. I have been training dogs professionally since 1999. 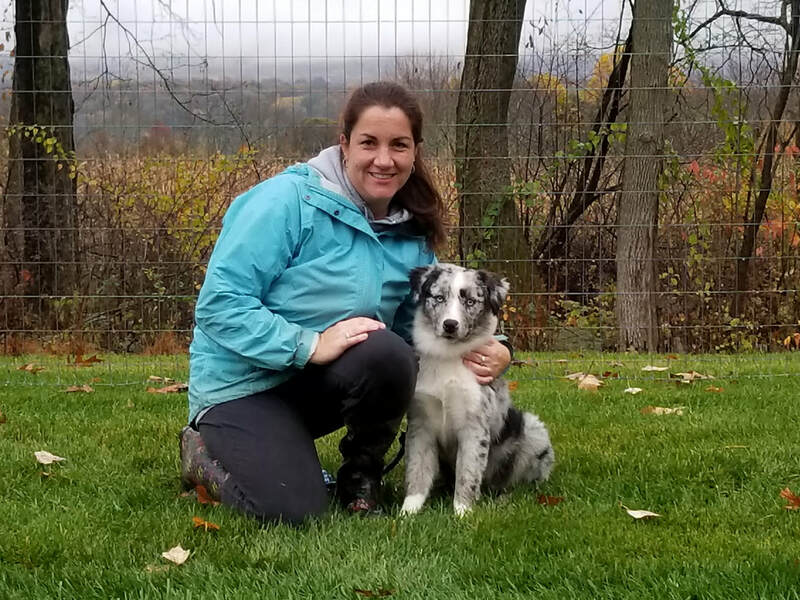 I train for a variety of interests-puppy training, basic manners, therapy work, agility, herding and obedience to name just a few. 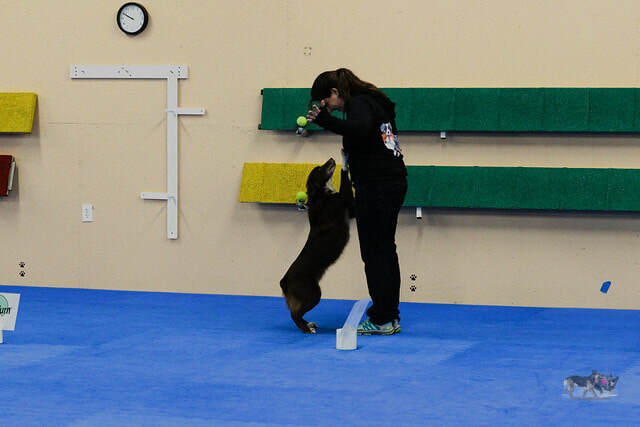 I compete with my own dogs in rally obedience, competition obedience, agility and herding. I worked at a kennel for 10 years and ran their training program. After I was married, Mark and I had our 1st child Kenny and when he was one we moved to Hunterdon County to a small 7 acre farm to run our animal business and raise our family with a farm lifestyle that we always dreamed of. We then had two more chikdren Cole and Katelyn, a horse, cats, nigerian dwarf goats, nubians, alpacas, chickens and many more aussies! We are very busy, but love every minute of it! This truly is a dream come true! I have owned a variety of different lines with this breed and have found that the breed has split in to two different types the working line and show lines. The working lines are smaller and less bone to their structure and have a more silky coat at times. The show lines are bigger, more bone and a lot more coat. I have owned both and my vision is to create a balance between the two. I often cross the types as I feel it is the best of both worlds! I recently also got into the miniature Australian Shepherd. There is so much debate on the internet as to the size variation of the breed. I can't stand the politics of everything today. The AKC changed the name to The American Shepherd (which by the way -all aussies originate in the US) This was also done for political reasons but I can say three of my minis are AKC registered Australian Shepherds! You can trace their ancestry back to some well known lines/kennels of standard size so to me there is an obvious size variation. Genes are a funny thing-you can have two short people produce a tall child and vice versa. All of my minis can be registered with Miniature Australian Shepherd Club. I have chosen to stay with the Australian Shepherd name as that's where all mine originated. What ever the size, I feel that the lines I have chosen have superior genetics as they were bred for overall ability which includes health, temperament and structure and movement in order to do their job. I wanted a dog that could help us out on the farm, but also be a loving member of our family and our dogs are just that! My aussies have an off switch when they are inside and very content to cuddle up and watch tv! I try and compete with all my dogs as much as possible, but those of you that are raising young children know that free time is very limited and so competing has taken a temporary back seat, but we are still getting titles. I often compete in UKC confirmation events as I feel they judge the actual dog! 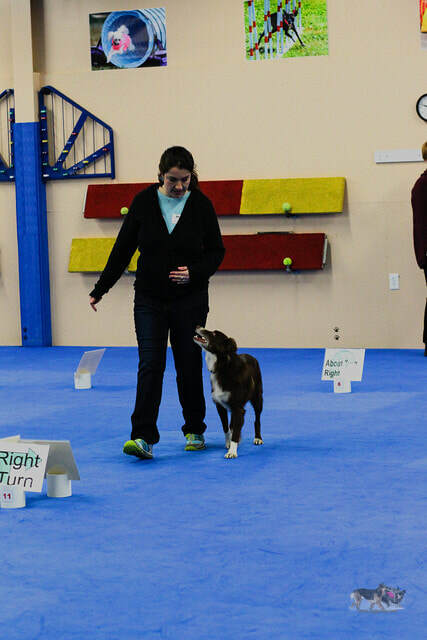 My dogs also attend classes every week for herding and obedience and confirmation. They get lots of practice as demo dogs with our current classes we run and tending to our small goat herd and alpaca herd.